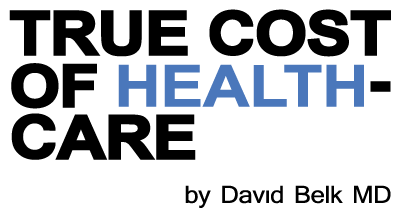 If there’s any cost in health care that should be easy to understand, it’s the cost of prescription medications. Pharmacies buy prescription drugs in bulk from pharmaceutical corporations and suppliers the same way they buy aspirin, and then sell them for a profit. But somehow this simple transaction is wrapped in so many layers of confusion that almost no one understands what’s really happening. So let’s start by trying to figure this out. Any time you go to a store (say, a grocery store) you expect to see all of the products being sold with their prices plainly displayed. When you go to the checkout, that’s the price you expect to be charged. You also expect to be able to check the price of the same or a comparable product in competing stores so you can shop around. That’s how the free market works. Imagine what it would be like if a grocery store never displayed the price of anything. And the price you’re charged might be totally different from the price the next customer is charged for the same product. In fact, suppose you couldn’t even pick your own groceries. A grocery list would be handed to you by a food expert and you’d be billed based on your particular grocery plan. Eggs might cost you $5, the next person $10 and some poor guy who doesn’t have a grocery plan would have to pay $50 for the same carton. Don’t even think about shopping around. Your grocery plan follows you everywhere and determines the price you pay and, since you’re only allowed to buy what’s on the list, you can’t even price compare similar items (like brown eggs vs. white eggs). The only way to save money would be to go without groceries. Do you think this would make food cheaper or easier to get? Well, whats described above is pretty close to how prescription medications are sold in the U.S.–Why? Most of the useful medications doctors now prescribe were developed prior to 1995. Prior to 2000 the vast majority of these medications were brand name only and rather expensive. A typical medication for high blood pressure or high cholesterol would cost $4-$5 per pill. For medicines taken daily (or worse 2-3 times per day) this could add up very quickly. This is especially true for a person taking 5 or 6 medications daily for a number of chronic diseases. Drugs started to become a significant portion of people’s medical costs, so insurance companies stepped in and offered plans that would cover a number of these medications (with many restrictions). Under these plans, the patient might only be responsible for a $10-$20 monthly copay instead of the regular $100- $150 monthly cost per medication. In the last decade most of the patents for these medications have expired, and so now more than 85% of the medicines that are commonly prescribed by doctors are generic and very cheap. Medications that used to cost pharmacies $400 for 100 pills (and then were sold to you for a profit) now cost pharmacies anywhere from $1-$10 per 100 pills. That’s right: many medicines got more than 100 times cheaper. What they sell them for, though, is their business. Prescription medication prices began dropping as more medications became generic. This would have been bad news for insurance companies if people found out, since it would undercut their control over prescription medication purchases. To prevent this news from getting out, insurance companies (or, rather, their pharmacy benefit managers which will be discussed in the next section) issued gag orders to pharmacies so they couldn’t discuss prescription drug prices with their customers. If a pharmacy violated their gag order, the insurance company would retaliate by not allowing their members to buy prescription drugs at that pharmacy. These gag orders ensured that most people would continue to use their insurance to buy generic medications even though they didn’t need to. 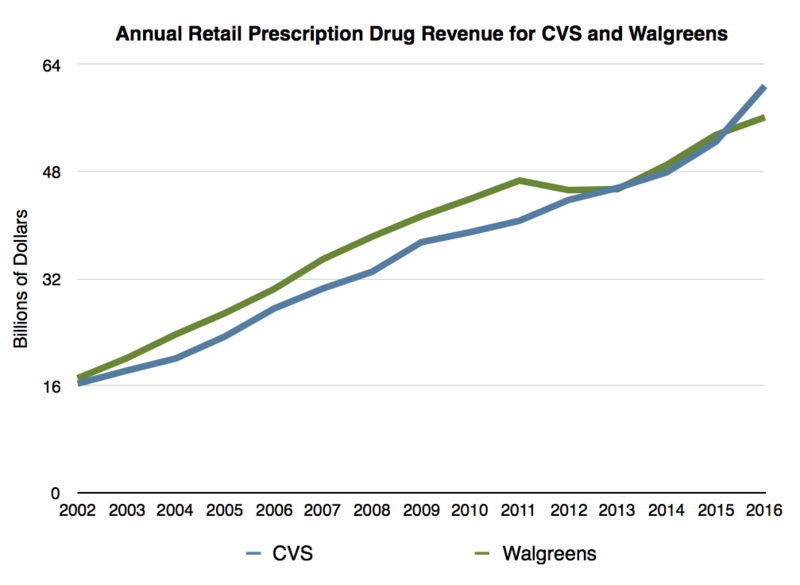 Figure 1: Annual retail prescription medication revenues for CVS and Walgreens. Figure 2: Annual number of retail prescription pharmacies in the U.S. for CVS and Walgreens. 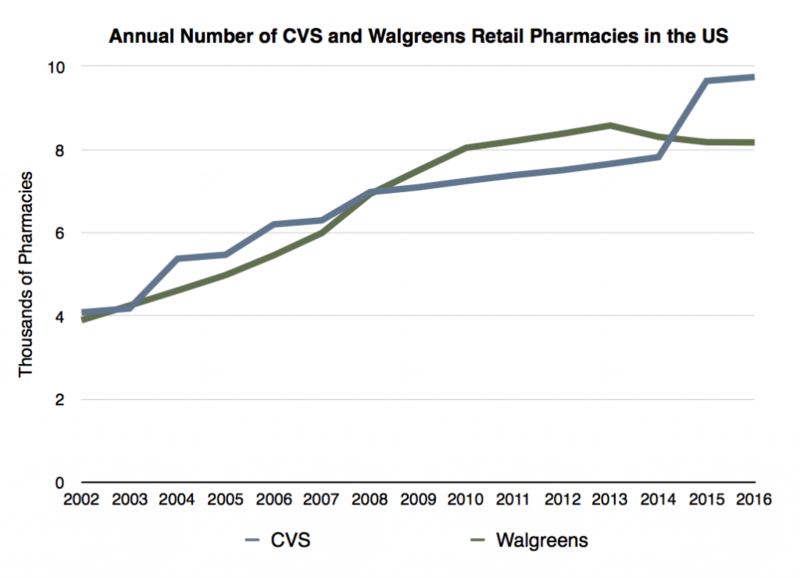 Since 2001 both CVS and Walgreens have nearly quadrupled their total revenue from retail prescription drug sales and doubled their number of retail pharmacies in the U.S. They were able to fund this growth mostly from the sale of generic prescription medications sold to customers, almost all of whom used a third party payer (insurance) to buy their prescriptions. What’s more, people might pay several hundred dollars a year to get prescription drug coverage on their insurance, even though that coverage often increases the amounts they pay for their medications and cost the insurance company nothing. It’s like buying a book of coupons that say “one for the price of two” at your local grocery store. You can see why they didn’t want to tell you about it. For years now, Wal-Mart has been very open about their policy of selling generic prescription medications to people without insurance. For $4, an uninsured person could get a one month supply of a generic medication. $10 bought 3 months of the same medication. Many have accused Wal-Mart of using their size and purchasing power to undercut the competition. In reality, Wal-Mart has nowhere near the volume of prescription medication sales Walgreens or CVS has. Smaller retail pharmacies like those in Wal-Mart or Costco can easily sell generic prescription medications at those prices and still make a profit because these medications are inexpensive to all pharmacies. The real story was how long it took for other pharmacies to catch on. Now the best way to compare the prices for nearly every prescription medication is to use the website goodrx.com. It will show you the cash price for each prescription medication at multiple pharmacies. For example the cash price for 180 tablets (a six month’s supply) of a blood pressure medication called losartan is only $15.52 (GoodRx.com lowest price on December 9, 2018). More examples include a full year’s supply of six different medications: Metformin for diabetes; amlodipine, atenolol, lisinopril and hydrochlorothiazide for high blood pressure and simvastatin for high cholesterol for a total cost of $115.28 for the whole year! Most people spend more than than for groceries each month. Also, you don’t actually need a Costco membership to buy prescription drugs there. You only need a coupon which can be easily printed from the GoodRx.com website.